Rather than meeting on Good Friday, our Chapter tradition has become for the brudders of NCS New Canaan to support a local Good Friday Prayer Breakfast organized by our brudders. This year, we encourage you to get a ticket (or two, for you and your spouse/significant other, or a table for you and your friends!) 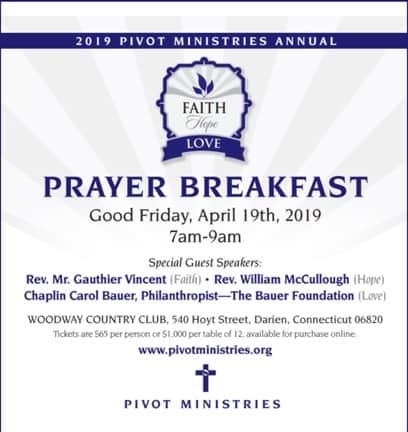 to the Pivot Ministries Good Friday Prayer Breakfast, April 19, 7:00 AM at Woodway Country Club in Darien. The amazing Pivot Men’s Choir is NOT to be missed. Tickets are $65 each. Click HERE to purchase a ticket directly (but if you want to sit at the NCS New Canaan table, you must get your ticket through the Chapter–see below). We are planning to organize an NCS New Canaan table (more if there is enough interest). Contact Paul Michalski (pmichalski@newcanaansociety.org) for information.